How do you create a surgery center in a disaster zone in the shortest amount of time possible? The aid group Doctors Without Borders (aka Médecins Sans Frontières, or MSF) has developed what they call a "plug and play hospital," a series of inflatable tents with generators and sanitation equipment designed to be mostly independent from the water and power systems typically unavailable after a catastrophe. 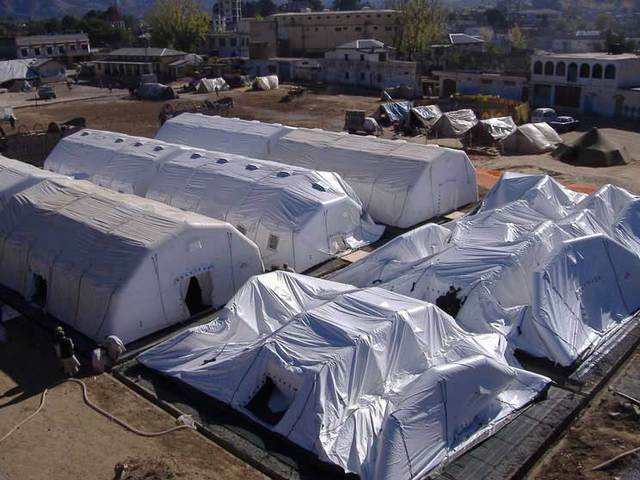 They are setting up one of these in Haiti right now: 9 tents, 100 beds, including surgery and intensive care areas. And if you think Windows install kits are heavy? This one weighs 41 metric tons. To learn more, I spoke to MSF Logistics Supervisor Laurent Dedieu in New York and Hocine Bouhabib in Haiti, who is managing the tent hospital setup today in Port-au-Prince. Boing Boing: There are reports that MSF and other aid groups in Haiti have been frustrated by delays in getting supplies where they're needed. Were your inflatable hospital supplies delayed? Hocine Bouhabib, MSF, Haiti: Yes, but the tents and technical equipment have finally arrived. The first shipment left Bordeaux, France, last Friday morning and was supposed to land in Port-au-Prince on Saturday, but after one and a half hours flying around Port-au-Prince, we were diverted to another site on the eastern side of the island, in the Dominican Republic. The airport there was not well-equipped, and unloading took us many hours and cost a lot of energy. We drove it in trucks to Port-au-Prince, and have been working nonstop, in 8 hour teams that trade off and go day and night. We hope to start offering medical treatment inside these structures Friday morning, if we can continue setup at this pace. Boing Boing: As we speak right now, where are you in the setup process? Hocine, MSF, Haiti: We've set up the plastic tile flooring, and we're connecting them on the floor. The mobile field hospital is 9 tents, and each is about 100 square meters, so the total is about 900 square meters. The land we're using is a former football field, so it's the perfect space for this, nice and flat. Port-au-Prince is very hilly, not much level ground, so we're lucky. I want to get this ready for medical activity as soon as possible. When you walk through Port-au-Prince and see all the devastation caused by the earthquake, and see all the injured people just sitting in the streets, patients just lying outside, and our medical team operating in very, very bad conditions -- they are waiting urgently for the structure. Our doctors have been doing their best but in a very bad environment. Boing Boing: Did your equipment make it in good condition? Hocine, MSF, Haiti: Yes, because we followed it ourselves, I was in the plane personally with the first cargo, and other colleagues followed the second cargo, and we accompanied it from the airport here on the island. No damage. The big frustration was the delay in landing the aircraft. Without that, we could have started surgical activity two days ago. Boing Boing: What is the total weight of these portable hospitals you're shipping by cargo plane? Laurent Dedieu, MSF, New York: The total weight is around 41 metric tons for the nine tents and all of the logistics equipment, like air conditioners, and electricity. That doesn't include the medical equipment, just the logistical part of the hospital. Boing Boing: How much of this gear is off-the-shelf, and how much do you have to modify or develop yourselves? Laurent Dedieu, MSF, New York: We are working with standard MSF equipment, we have R&D centers and storage in Europe, in Bordeaux and Brussels. When the equipment reaches the field, typically you have to face some technical issues, some small problems, but the big issues have been solved. One of the problems we had the first time we used this hospital in Pakistan in 2005 was that there was a big difference in temperature between day and night, at night the tents were deflating. The pressure inside the tent was not enough and was creating a problem. Now we have gauges that constantly measure the pressure and trigger compressors to re-inflate if it goes too low. Boing Boing: What about communications, are you using regular cellphones mostly? Laurent Dedieu, MSF, New York: You want to have a central pharmacy as close as possible to the hospital, but you need communication between the two to organize the drug supply. In Haiti, some mobile phone networks are operating for voice and data, but it's not yet stable. Some areas of Port-au-Prince have better coverage than others. As a backup, we use small handset VHF radios for local communciation. And for external communications, we're also using satellite phones. Boing Boing: Where did the idea for these temporary hospitals come from? Laurent Dedieu, MSF, New York: Various Army forces have had the same need for hospitals that can be deployed in a very short period of time. The US Army calls them MASH units. The problem we faced was needing to perform surgery without any construction work which can take weeks or months in remote areas. So that's how the idea of inflatable tents came up. There are people at MSF who look for these kinds of solutions every day, the research is a full time job. Boing Boing: How do you get surgical sterility in these things, how do you set up clean operating rooms on the fly? Laurent Dedieu, MSF, New York: Inside the tent, there is a kind of double linen which is completely closed. It's a kind of PVC canvas which can be cleaned with chlorine or other sterilizing products. Boing Boing: MSF first began using these inflatable hospitals in Pakistan, after the 2005 earthquake. You've used them to respond to disasters in Sri Lanka, Indonesia, and Nigeria since then. Are you doing things technically different in any way to adapt to conditions specific to Haiti? Hocine, MSF, Haiti: The main difference this time is that we have more experience with the equipment. The first time, 2005, in Pakistan, it was not easy for the team in charge on the field to set up the hospital correctly. After four years of using these in different environments, we know. Boing Boing: How specific of an environment do you need to make this work, how flat does the ground need to be and so on? Laurent Dedieu, MSF, New York: You need at least 5-6,000 square meters of ground. As flat as possible, a maximum slope of one percent, and clear of rocks or debris. Then we add these plastic tiles. Then you have to take security into consideration. If you are in a war zone, an inflatable tent does not protect patients and staff very well. But so far in Haiti that has not been a problem. Boing Boing: Much US media coverage is focusing on what is described as a worsening security situation there. How does your staff perceive that, is it affecting your work? Laurent Dedieu, MSF, New York: We were lucky to find a very nice space close to one of the four MSF medical facilities we were already operating before the quake. So we're continuing to work in the same area where people were already familiar with our presence. Boing Boing: Here's a question from one of our readers on Twitter: What happens to patients after they receive first aid care or a surgical procedure? What portion of these facilities will be dedicated to aftercare? Laurent Dedieu, MSF, New York: The hospital includes a recovery area, some patients need additional surgical procedures after the first one. And we're planning a medium- to long-term rehabilitation project. Many patients will have lost some physical abilities. Many will have had limbs amputated. You have to provide them prostheses. You have to help them work again, to go back as closely to their normal lives as possible. Port-au-Prince is an economically tough, highly competitive environment for residents. People with major disabilities will have to compete for jobs against people who have complete physical integrity. You have to give these guys the biggest chance to find work and be as functional as possible. Knowing how hilly Port au Prince is, moving around those slopes will be very hard for people with major disabilities. This aspect of our work is longer term, and will take a lot of time judging by how many people were injured to that extent. Boing Boing: Another reader question from Twitter: What do the people at MSF need that those of us far away from Haiti can provide? Are you seeing donations come in? What would you say to those motivated to help? Laurent Dedieu, MSF, New York: Financial donations are always helpful. We have to be careful—so many people want to donate drugs or equipment, but it's hard for us to make use of that. We prefer to use our own supply center with our standard equipment and drugs. Money is more helpful. If people want to volunteer, particularly those of you with special technical skills to offer, you can apply at MSF.org. Right now there is this dramatic emergency in Haiti, but there are many other needs around the world, and there will be more in the future. The need in Haiti will go on for years. Boing Boing: What if someone has some awesome technology idea, or has developed something they think can solve some of the needs in your emergency medical work? Laurent Dedieu, MSF, New York: The first phase of an emergency is not the best moment to test new technology. But for sure, if you have a technology idea you think can be helpful, share it with us, and we will see if it can be adapted to our work. We will really try to answer everyone. People shouldn't expect fast feedback from us right now, we have so many requests we can't answer everybody, but we try. Laurent Dedieu, MSF, New York: It's always tempting to copy-paste technology that works in Euorope or the US and say, 'Great let's put it in place to respond to this emegency.' Right now, people in Haiti are really overwhelmed by the basics. To introduce something completely new, where they're not sure how to use it or we don't have feedback -- the tents even, the first time we used them we actually had a lot of problems. Because we didn't think about this issue of the temperature variance. And a nice idea that's supposed to help you and facilitate your work can make you lose time. New technologies require a lot of field testing before they can be implemented. Boing Boing: So an emergency isn't a good time to alpha-test. Laurent Dedieu, MSF, New York: Correct. You need to allow extra time for anything new. You'll always find problems that require time and human resources to solve. Right now, we need our teams to focus on their immediate priority of providing life-saving emergency medical care to the people in Haiti. Boing Boing: Hocine, how are you and your colleagues there in Haiti holding up? Hocine Bouhabib, MSF, Haiti: We're fine. We had a long trip to get here in the cargo plane with the equipment, and when we arrived we didn't have time to rest, we started setup immediately. Since we arrived, we haven't slept much, just a couple hours at a time. The motivation to get the structures set up is carrying us through. We are really committed. Even though we are all very tired, we'll keep going until the medical activity can begin.